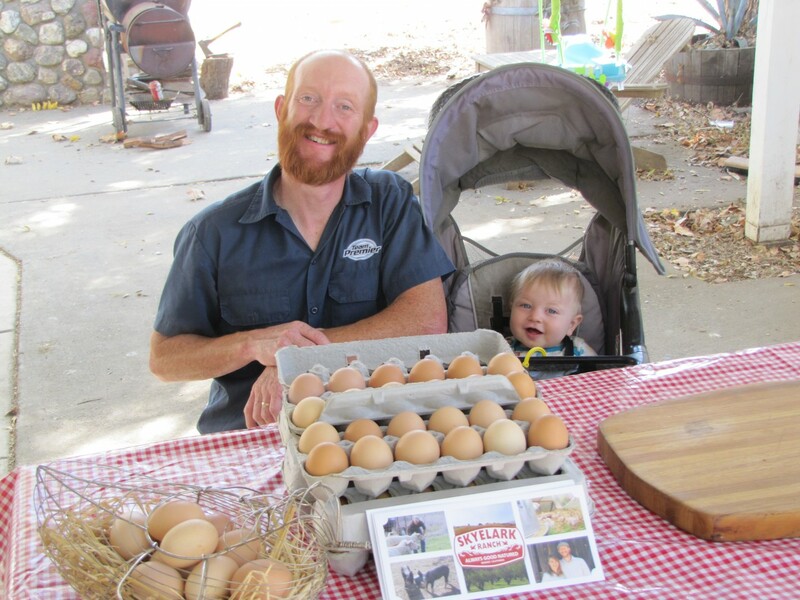 Our first featured farm is Skyelark Ranch, located in Brooks, CA. I've been buying pastured eggs from them at the Davis Farmers Market for the past several months and have been impressed by the high quality - they have such beautiful, brightly-colored, firm yolks! Skyelark Ranch is owned and operated by Gillies and Alexis Robertson. They lease 60 acres of land (about 20 acres of almonds, 20 acres of hay, and 20 acres of grazing land) in Brooks, as well as other acreage in Yolo County. Gillies was kind enough to take the time to speak with me in the middle of their busy lambing season. Skyelark’s specialty is in diversified livestock - raising animals well and humanely for meat (lamb, pork, chicken) and eggs. Living in harmony with nature, they maintain their flocks in a way that benefits both the soil, by maintaining moisture and using ground cover, and their livestock. Skyelark’s pasture land and animals are raised without routine herbicides, pesticides, antibiotics, or growth hormones and their pigs are fed GMO-free feed. The philosophy behind their work is for them to do something they enjoy and have it be something worthwhile: producing healthy protein from healthy animals. As I was wondering about their name, Gillies told me that Skyelark is a play on the word, “skylark”. (Gillies is a birder) It’s a combination of the name of their dog, Skye, who was named after the Isle of Skye - a place that they both love off the coast of Scotland - together with the “lark” of jumping into starting a small family farm and having a bit of fun. I am always curious about what draws people to what they do. Both Gillies and Alexis have degrees in Environmental Management and Alexis also has a Masters in Soil Science. After several years of working in environmental conservation and through conversations with friends, they settled on the idea of producing food. Although they originally thought about having a farm with orchards and vegetables, they realized that they both liked working with animals more than being farmers. The Robertsons moved to the Capay Valley in 2010, with 3 or 4 sheep to start, then added ewes, chickens and more sheep over the next 4 years. The people who had been on the property before them left behind a sow. After a good experience raising her, friends suggested that they should raise more pigs because they taste so good and fit in well with the farm's diverse population. Laying hens have always been a part of their farm. In 2014, they went all out and bought an established egg-laying business with 2,000 hens. Their flock is currently around 1,400 and they are in the process of adding more chicks this spring to build it back up. Those chicks should be mature enough to be laying eggs by the summer. 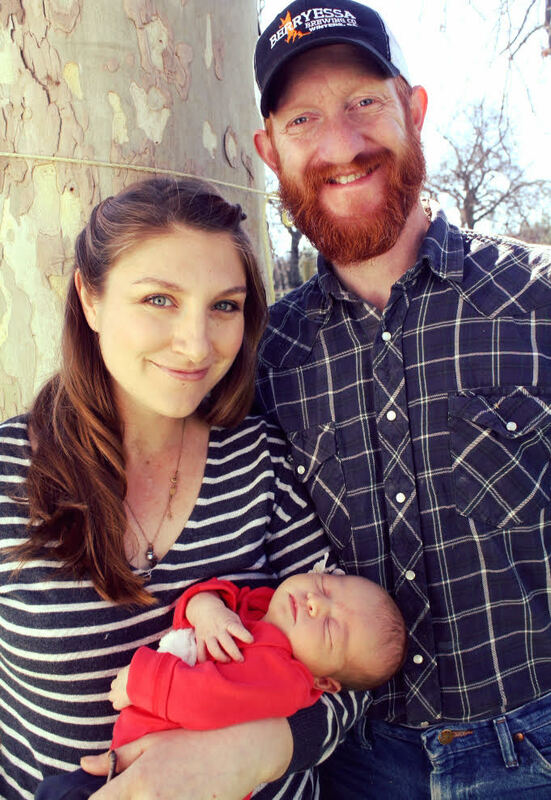 Gillies and Alexis have chosen to raise breeds of animals that can withstand the hot, dry summers of Yolo County, a decision that fits well with one of the tenets of Chinese medicine that I promote: living in harmony with the seasons. Their sheep and pigs are able to handle the heat, but their meat chickens are not, so they only raise those in the spring and fall. 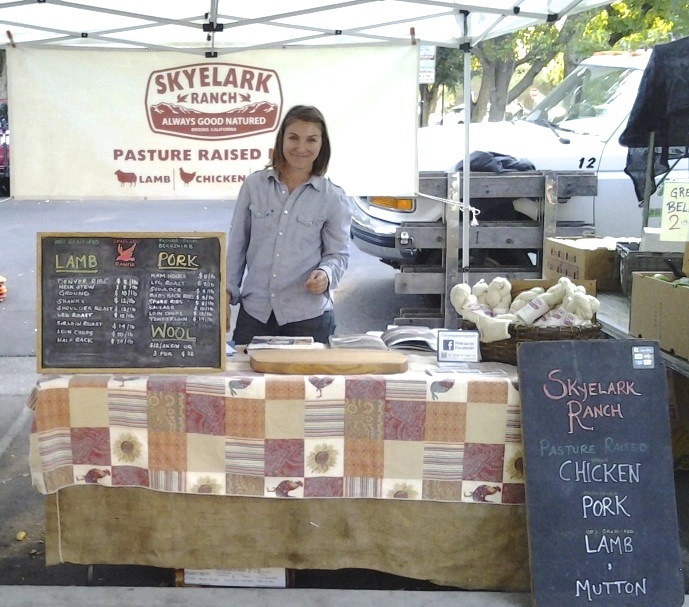 Skyelark Ranch can be found selling their meat and eggs under the covered section of the Davis Farmers Market on Saturdays, and on Sundays at the Jack London Square in Oakland. Their products are sold at V. Miller Meats in Sacramento and can also be purchased directly from them via their website. Available year-round: Grass-fed and grass-finished lamb, pastured eggs, and with some fluctuations in availability, pastured Berkshire pork. Available in the spring and fall: Pasture-raised broiler meat chickens (fresh for a week, then available frozen). They also have stewing hens, ducks, and bones for stock or bone broth, and pigs trotters (a traditional Chinese food for postpartum women). Visitors are welcome at Skyelark Ranch, but be sure to get in touch first because it is a working ranch. The best times of year to visit are now through the end of spring and fall through winter. Gillies doesn’t recommend visiting during the middle of summer because it is usually so blazing hot and dry then. I encourage you to visit them at their stand at the Davis Farmer’s Market or to arrange a visit. Be sure to say “hello” for me! And while you’re there, pick up some eggs - you won’t be sorry!